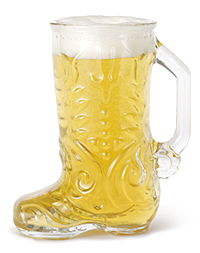 Serve up a boot scootin' good time in our Glass Boot Mug. This great glass western favor measures 6 inches high and holds 12.5 ounces. Send your cowboys and girls home with these to remember your hoedown. 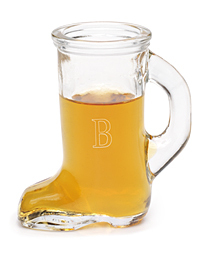 For your all-out Western wedding, why not go all the way with cowboy boot beer mugs? Fun for serving tapped beer at your country-casual reception, they also make great groomsmen gifts. The pressed-glass patterned mugs each measure 6 1/2 tall with a 3 1/4 mouth and a 3 7/8 base, just the right size for 16 ounces. Add some humor to your casual reception with some novelty shot glasses to get your guests in the mood for an authentic hoedown. Shaped like cowboy boots measuring just 3 1/8 tall, theyre a kitschy and unexpected way to bring some revelry to the reception. Can be personalized with up to 3 engraved initials. Diameter is 2 Â¾ and holds 1 Â½ ounces. To leave Western Boot Mug and see more country themed ideas, start here.